I have been wanting to try this design ever since I heard about Incoco, and it's exactly what I wanted it to be. I love the fact that it is both vintage and modern at the same time. Definitely work appropriate, from a normal arm-length distance they look burgundy, almost black, so they are not too obvious. In the sun, they are almost pink. From a closer perspective, it's classy fishnet at its best. And most of the time it is a red-based purple with perfectly diagonal patterns. I highly recommend Reckless if you like feminine looking nails. The best part about these appliques is that there is no waiting on drying time, I just apply them and go! i like the design its so pretty. 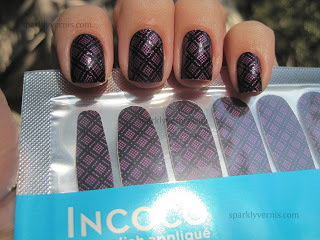 I've heard lots of good things about the Incoco appliques, I'll have to try them sometime! Love this design!! I only have tried nail strips once and I failed miserably. I have a few more designs, so I am going to try again and hopefully do better. lol. You did a really great job! @ beauxs mom: it is! I wish I could do this myself, but I don't do stamping. @ Laura: me too, and now I know why, they are amazing!